U.S. President Donald Trump meets with Qatar's Emir Sheikh Tamim bin Hamad al-Thani in New York, U.S., September 19, 2017. UNITED NATIONS - Qatar’s Emir Sheikh Tamim bin Hamad al-Thani on Tuesday renewed a call for “unconditional dialogue” to end a crisis pitting Qatar against four Arab states while U.S. President Donald Trump said he expected the dispute to be resolved quickly. Speaking from the podium of the 193-member United Nations General Assembly, Sheikh Tamim renewed the call “for an unconditional dialogue based on mutual respect for sovereignty”. Saudi Arabia, the United Arab Emirates, Egypt and Bahrain cut diplomatic and trade links with Qatar on June 5, suspending air and shipping routes with the world’s biggest exporter of liquefied natural gas, which is home to the region’s biggest U.S. military base. The nations say Doha supports regional foe Iran and Islamists, charges Qatar’s leaders deny. Kuwait has been trying to mediate and the United States has taken an increasingly robust role in trying to end the crisis, but as yet to no avail. 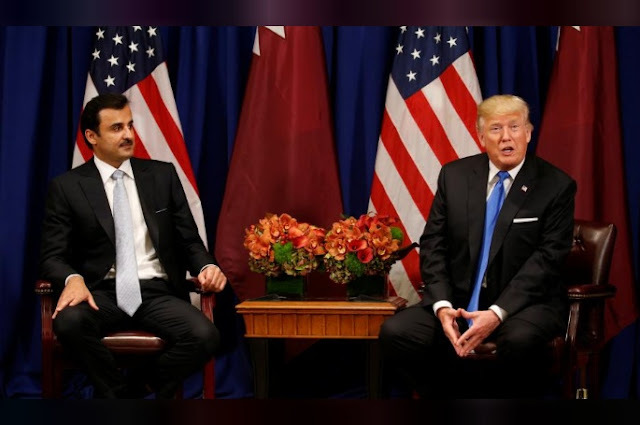 Trump and Sheikh Tamim later held a meeting in which the emir was careful to emphasize the strong Qatar-U.S. relationship after Trump appeared to be more sympathetic to the Saudi position at the start of the crisis. Qatar hosts Al Udeid air base, the largest U.S. military facility in the Middle East. Trump, who has said he would be willing to mediate the worst dispute in decades among the U.S.-allied Arab states and Qatar, said he had a “very strong feeling” the dispute would be solved “pretty quickly”. “The countries who imposed the blockade on the State of Qatar interfere in the internal affairs of many countries, and accuse all those who oppose them domestically and abroad with terrorism. By doing that they are inflicting damage on the war on terror,” Sheikh Tamim said in his speech to the annual gathering of world leaders. “It’s disappointing that he talks about interference in the internal affairs of others while refusing to admit that is a core part of the four nations’ complaints against Qatar,” the official added. Earlier this month, Saudi Arabia suspended any dialogue with Qatar, accusing it of “distorting facts,” just after a report of a phone call between the leaders of the two countries suggested a breakthrough in the Gulf dispute. Saudi Arabia’s Crown Prince Mohammed bin Salman spoke by the telephone with Qatar’s emir in the first publicly reported contact between the two leaders since the start of the crisis. Qatar’s Emir Sheikh Tamim bin Hamad al-Thani on Tuesday renewed a call for “unconditional dialogue” to end a crisis pitting Qatar against four Arab states while U.S. President Donald Trump said he expected the dispute to be resolved quickly.